Dr. Wendy Sealy has been identified as HCC's newest Champion to strengthen the contribution of nursing professionals in a coordinated, whole of society response, to NCDs in the Caribbean. As health care professionals and caregivers with a long history of dedicated commitment to working in communities, nurses are critical partners in a multisectoral response to the chronic diseases in our region. They are often the heart of thriving health NGOs and they have significant expertise and insights to contribute to the civil society NCD movement. We welcome Dr. Sealy to the HCC and look forward to her leadership in this area. 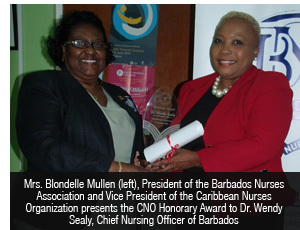 Dr. Sealy was recently awarded the Caribbean Nurses’ Organization Honorary Award. Visit the Conference website www.healthcareconference.ky. 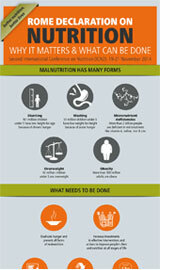 GET THE TOOLKIT: Visit UniversalHealthCoverageDay.org to download our first Communications & Advocacy Toolkit! Inside you’ll find key messages and 12 ways to build momentum for 12.12.14. Invite your networks to join the movement. Link health for all to the issues you care about. 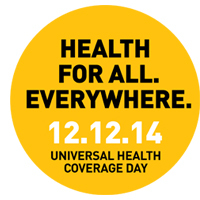 Support #healthforall in our virtual photo booth here. Show the human side of UHC. Promote powerful quotes about UHC. Time important announcements to 12 December. The importance of obesity as a public health problem has led to a number of proposed policy solutions, some of which - such as taxes on sugar-sweetened beverages — are highly controversial and have been opposed strongly by the food industry. One such measure is the proposal by the New York City Department of Health, supported by Mayor Michael Bloomberg, to prohibit sugar-sweetened beverages from being sold in containers larger than 16 oz by restaurants, movie theaters, and mobile food vendors (venues where the health department has jurisdiction).This action and others that affect business practices of the food industry are likely to be challenged in the courts in cases that raise an important question. Does government have the legal authority to regulate the conduct of the food industry in this way? This question of authority applies to many policies that might be considered in the future - policies regarding, for example, the placement of items in supermarkets, children's access to certain foods, and the banning of harmful products (e.g., caffeinated alcohol drinks). Read more. 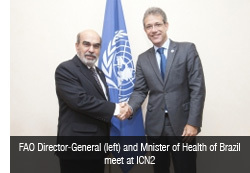 Brazilian Minister of Health: "ICN2 is an unquestionable success"
HCC News Roundup Archive - If you have missed any of our News Roundups you can view previous Roundups on our News Roundup Archive webpage here. HCC Featured - Previously featured Members, events and news can now be found on our HCC Featured webpage here. If you do not want to receive future emails from the Healthy Caribbean Coalition please send an email with Unsubscribe in the subject line to unsubscribe@healthycaribbean.org.